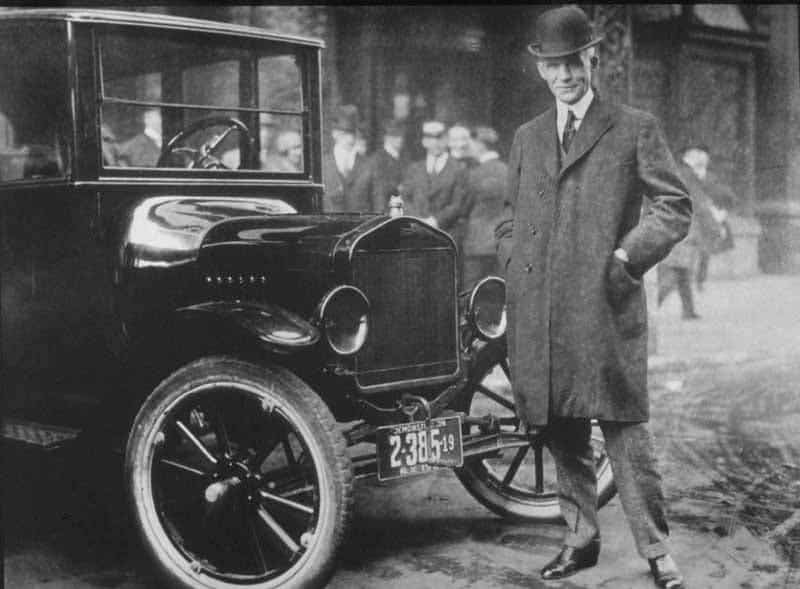 Ford Motor Company founder Henry Ford. Photo Credit: Library of Congress. One day in 1885, the twenty-three-year old apprentice machinist Henry Ford came into contact for the first time in his life with the gas-powered internal combustion engine. It was love at first sight. Instantly, a wave of excitement overcame him for he envisioned even at that tender age and during those uncertain times that horseless carriages will forever revolutionize transportation. This was to be his life’s work. Though he didn’t invent the automobile, nor the assembly line per, Henry Ford’s extraordinary vision and entrepreneurial spirit caused a massive paradigm shift with global implications. What was once a good reserved only to the wealthy and affluent, was now widely available to blue-collar Americans. The Model T made its debut in 1908 with a purchase price of $825.00. Over ten thousand were sold in its first year, establishing a new record. Four years later the price dropped to $575.00 and sales soared. By 1914, Ford could claim a 48% share of the automobile market. In 1927, the 15-millionth Model T ceremoniously rolls off the assembly line at Highland Park. 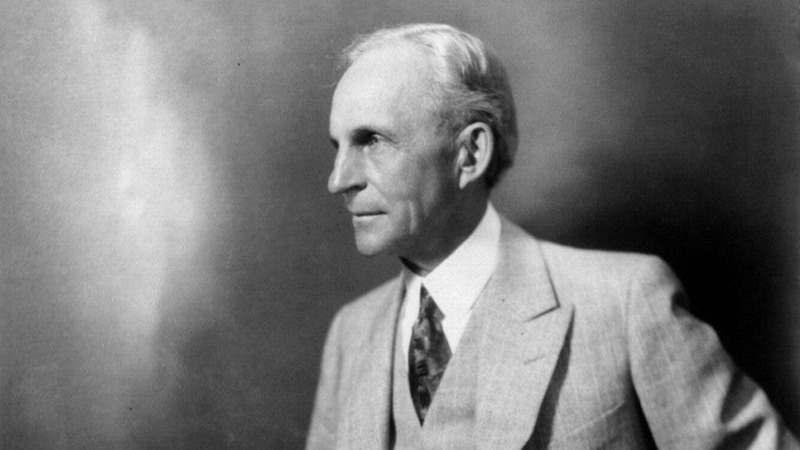 This was an unthinkable scenario only two decades before, but by this time Henry Ford had already changed the world. It all started during the days Ford worked as an engineer for the Edison Illuminating Company. By night he would be away at his job, but by day Ford would toil in a workshop in a shed behind his home designing and building a new internal-combustion engine. He would work by himself using pieces of scrap metal he salvaged from anywhere he could find them. 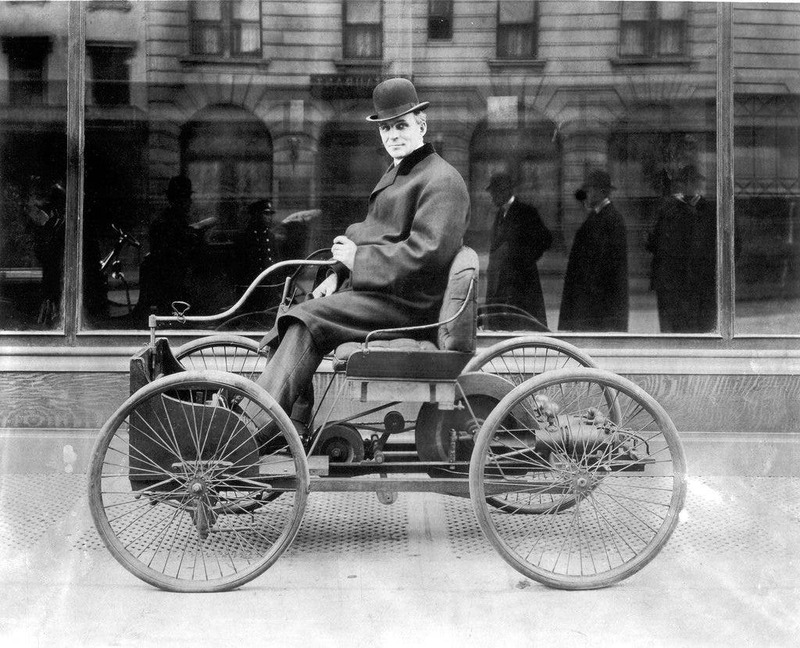 After two years of spending nearly every free minute refining his engine, Ford completes his first automobile, the “Quadricycle,” and drives it through the streets of Detroit. The contraption was basically a carriage powered by a motor, but though it looked nice and ran well, its design was inadequate for large scale manufacturing. A year later he unveiled a new model, this time thinking ahead to the production end of the process. It was a compact and simple vehicle, one that was easy to maintain. All he needed was some financial backing. Easier said than done, though. Automobile businesses were rising out of thin air, and disappeared just as suddenly – this was something Ford learned the hard way. During his ventures, he finally sealed backing from one of the most prominent bankers in Detroit, William H. Murphy. A new company was formed called Detroit Automobile Company to build and market Ford’s improved Quadricycle. The young Ford quickly found, however, that his prototype needed serious revision. His model was great a proof of concept, but the parts he used were hard to ship and some were too clunky or heavy. Yet again, the demands of mass manufacturing overwhelmed him. He went back to the drawing board, but it took too much time, so Murphy soon lost patience. After just a year and half the Detroit Automobile Company was dissolved. Ford returned with a lightweight and smaller vehicle, and to his good fortune Murphy decided to give him a second shot – something extremely rare to witness during the fledgling days of the automotive industry. The two, banker and engineer, started a new company called the Henry Ford Company. But yet again, the venture didn’t last long. But this time around, it wasn’t Ford’s process that failed, but Murphy’s pesky interference. The banker brought outside help which injected the project with mediocrity and low standards. In his mind, Ford thought he had the perfect design, and less than a year after the company was formed he left. At this point, Ford become a persona non grata in the Detroit car business and financiers wouldn’t touch him not even with a ten foot pole. Somehow, the engineer remained high spirited and treated all his past failures as valuable life lessons. But was to be learned? Well, Ford knew very well that it wasn’t his work that was wrong and collapsed his past ventures; it was his financiers who were unwilling to grant him more time and wanted to compromise too much on quality. If he was going to make it, it had to be his way. As is often the case with extraordinary people, Ford joined forces with another eccentric individual, Alexander Malcomson a Scottish immigrantwho made a fortune in the coal business. Malcomson saw potential in Ford, gave him a shot when no one in Detroit would think of it, and agreed to no meddle in any way in his affairs. Together with ten other smaller partners, they incorporate the Ford Motor Company. Free to express himself creatively and with enough air to breath, Ford would set the stage for the iconic Model T.
After producing nine models, including the racing Model B and the luxurious (for its time) Models L and R, Ford was ready to fulfill his ambition to make “a motor car for the great multitude” – a high-quality automobile that would be affordable to everyday people. Charles Sorensen was one of the main artisans behind the Model T, alongside Ford. The room he had in mind became the maternity ward for Model T. A year later, out of this cluttered little dark room came out one of the most iconic American vehicle and the car of the XXth century. The first production Model T Ford (1909 model year) was assembled at the Piquette Avenue Plant in Detroit on October 1, 1908. Over the next 19 years relatively few fundamental changes were made to the basic design, which went on to sell 15 million cars. Model Ts produced 20 horsepower and could reach speeds of up to 40 to 45 mph (65 to 70 km/h). That might seem sluggish, but remember this was the turn of the past century and the speed was more than enough for the dirt roads of the time. The transmission, consisting of two forward gears and one reverse, was of the planetary type, controlled by foot pedals rather than the more common hand lever used in sliding-gear transmissions. Spark and throttle were controlled by a hand lever on the steering column. Because gas was fed into the engine by gravity alone, when drivers had to drive up a steep hill the car often had to be driven backward in reverse gear. The only instrumentation included on the dash of the Ford Model T was an ammeter, which measures electrical currents running through a circuit. If you wanted a speedometer, you had to pitch a couple of extra bucks. If you wanted to gauge the fuel level, you just had to dip a stick into the tank and check how wet it got. As basic as it gets. The Model T could also run on gas, grain alcohol, or ethanol. Farmers could easily distill their own fuel and use Ford’s vehicle as they pleased, without having to depend on gas supply which was rather scarce. Definitely, this was the most robust vehicle the world had ever seen. There was no stopping it. As a fun side-note, Ford was quoted as saying “The public can have any color it wants… as long as it’s black.” He may or may had not said that, but what’s certain is that this was never enforced. Though black was clearly the favorite paint job, customers rolled off from the Detroit plant in brand new Model Ts coloured in red, blue, green, or gray. Rather than the car coming to individual workers, a team of workers came to the car. Ford, like other auto makers of the time, produced cars in this fashion for four years before the introduction of the moving assembly line. When the Model T was introduced to the public in 1909, its listed sales price was $825.00 (some $33,000 in today’s money). It sold so well that the plant had orders booked one year in advance. The affordable price was possible thanks to some assembly tinkering. Prior to the Model T, cars were assembled one at a time by individual teams. It could take two to three weeks for a car to be made. Ford transformed how cars were put together by using of large production plants and standardized, interchangeable parts. 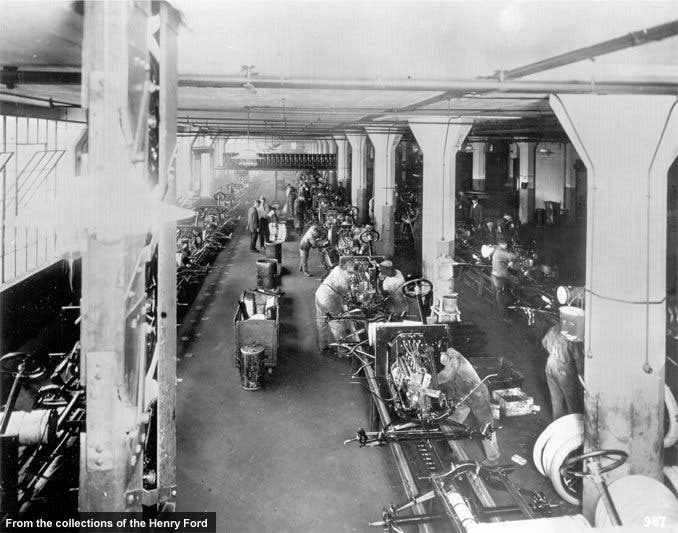 “What was worked out at Ford was the practice of moving the work from one worker to another until it became a complete unit, then arranging the flow of these units at the right time and the right place to a moving final assembly line from which came a finished product. Regardless of earlier uses of some of these principles, the direct line of succession of mass production and its intensification into automation stems directly from what we worked out at Ford Motor Company between 1908 and 1913…,” according to Sorensen. The big break came when the first car came out of the world’s first moving assembly line. On a trip to Chicago , Henry Ford observed meat packers removing cuts of beef from a carcass, as it was passed along by a trolley, until nothing was left. He was inspired to reverse the process for the production of his automobile. Chassis construction was the final step in Ford’s transition from static to moving assembly. This 1914 photo shows in-progress chassis on the line. The moving lines cut the Model T’s final assembly time in half, from 12 hours to six. Continual adjustments and refinements kept reducing final assembly time until nearly four more hours were saved. Basically, each worker was now assigned to fitting a single part of screwing bolt and nuts. This dramatically increased production and lowered the Model T’s cost down to $575.00 only four years later. Some components took longer to put together and attach than others. Subassemblies were established for these. For example, each radiator with all its hose fittings was put together on a separate line feeding into the main assembly line. The interval between delivery of the car and its components was carefully timed to maintain a continuous flow. 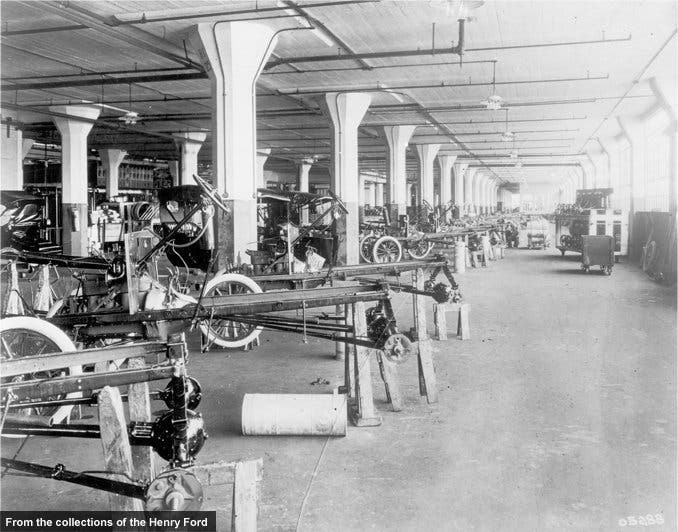 Ford’s team tackled chassis assembly in August 19013 and quickly cut completion time from 12 hours to six. It was down to slightly less than three hours by October, then to 2.3 in December. Four years prior, Ford assembled 10,660 Model Ts. By 1912, output was up to 68,773. But those numbers were dwarfed by the results of the moving assembly line. The process netted 170,211 examples in 1913, 202,667 in 1914, well over half a million in 1916, and 735,020 in 1917! After a sluggish period after America entered the world war, production came down. The market, however, rebounded in 1920. That same year Ford topped the one million mark with 1,301,067 Model T’s made at the Highland Park Plant near Detroit, Michigan. On May 26, 1927 the last Model T left the assembly line, bringing the total mark at 15 million cars. In the process, Ford had achieved his mission for his economics of scale had not gone unnoticed. The whole world had to adopt his model to keep up. 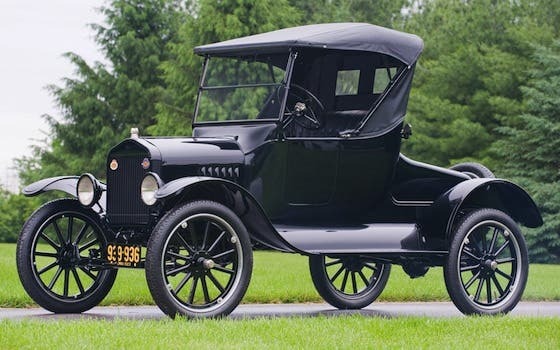 Competitors were selling millions of cars as well, so by the end of the Model T’s 19-year run, it was fair to say that Ford really had put the world on wheels. Ford’s transition to moving assembly lines began in April 1913 with the integrated (and complex) flywheel/magneto. With each worker assigned to complete a few specific tasks rather than build the entire unit, Ford reduced magneto assembly time from about 15 minutes to 5, and the required workforce decreased from 29 to 14. The moving assembly line, with all its benefits, ushered in an age of human workforce automation which could be extremely cruel for the human spirit. When each worker feels like a cog in an enormous well oiled machine, moral can be low and Ford had huge turnovers. 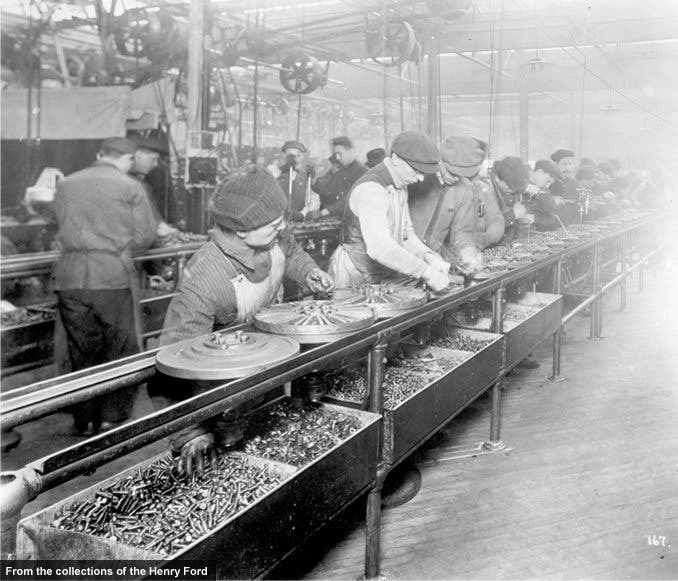 In 1913, for example, Ford was forced to hire more than 52,000 workers to sustain a workforce of about 14,000. Ford tried to tackle this by introducing the $5 a day wage on January 5, 1914. There was a catch though: the basic wage was $2.34, and for the extra $2.66, a worker had to meet company standards for clean living, including sobriety, no gambling, thrift, and a happy home environment. The company had its own social department which would visit the workers’ homes and determine whether they complied. Turnovers dramatically improved, and Detroit’s economy bustled. After the Model T was discontinued, Ford invested massively in a new plant and released the Model A which performed rather modestly compared to its predecessor. In 1932, Ford introduced the first V-8 engine, but by 1936 the company had dropped to number three in sales in the automotive industry. Its heyday was past at this point, but the legacy remained. To this day, Ford is still one of the biggest auto companies in the world, all thanks to the visionary leadership of Henry Ford who practically built his company from scrap metal. Automobiles were no longer a new thing when the Model T came out. What Ford managed to do was make them universal.